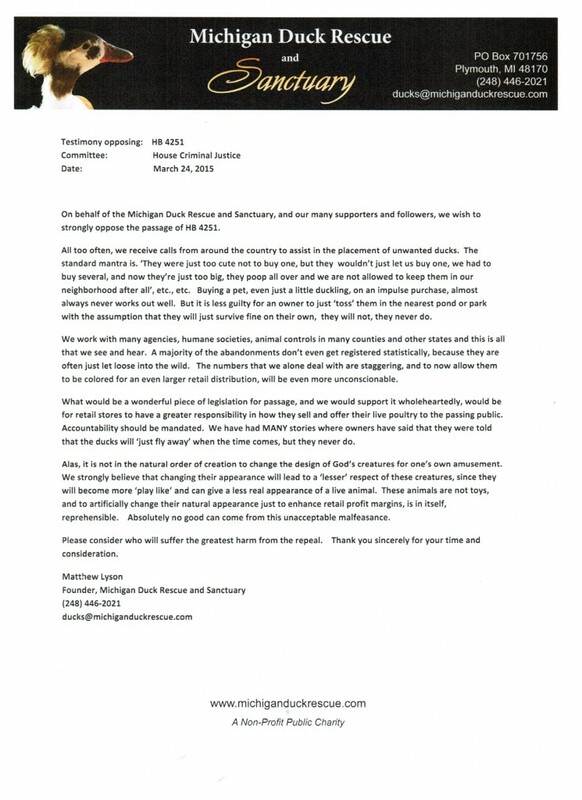 Yesterday afternoon, I received a call from Jill Fritz, Michigan Senior State Director of the Humane Society of the United States, asking if we would like to submit a letter on behalf of the Michigan Duck Rescue and Sanctuary to help in opposition of a repeal attempt of a state bill. 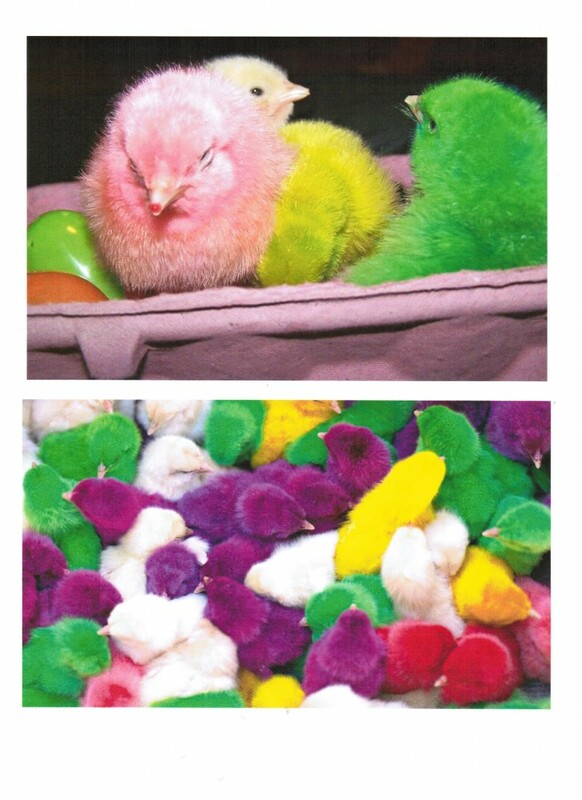 Synopsis: In 1945, the State of Michigan Legislation passed a bill prohibiting the sale of artificially colored animals…(see the bill below). 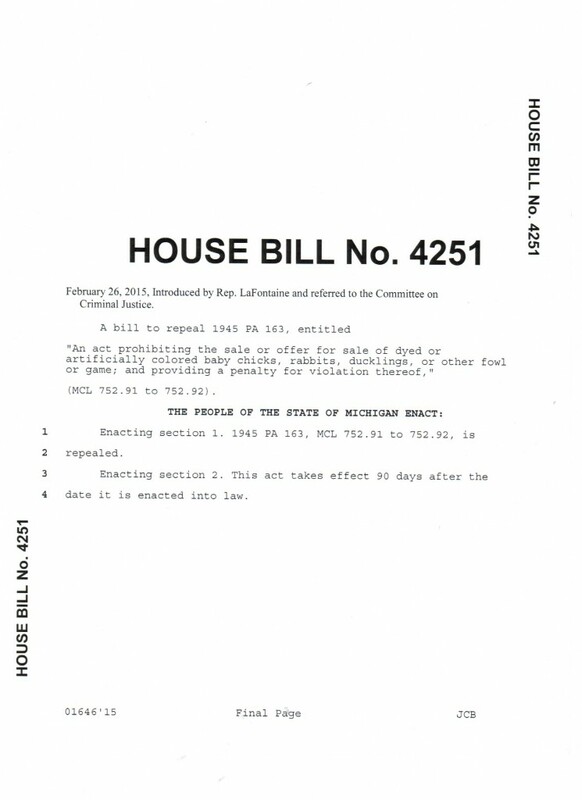 In the meantime, State Representative Andrea Lafontaine (R-District 32) felt that her most pressing issue at this time in the current state legislature, was to sponsor a bill to repeal this ‘archaic’ law. While it is the states current position to try to eliminate old and often unnecessary laws, we strongly feel that this is one law that should be left untouched. In all fairness, I tried to contact Rep. LaFontaine yesterday at her Lansing office, and left a message in hopes to discuss this bill prior to the committee meeting. As of this post, I have yet to hear from her, or her staff (interesting though, she has a promo video in which she talks about transparency and how important feedback is to her). She was also not at the committee meeting this morning at 9:00am. 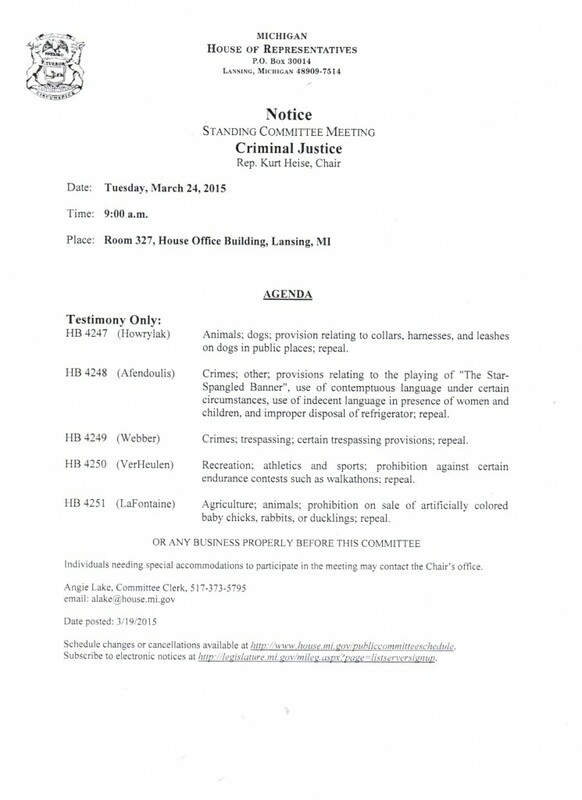 Back to the request from Jill, as I thought about the importance of the bill for the safety of the animals, I felt that it was in our best interest to appear in person and give live testimony before the Criminal Justice Committee, which I did. It was a rewarding experience, and of the handful of bills brought up for review, this one had the largest response, all favorable. Now it is up to the Michigan House CJC to do the right thing and deny the repeal request. A side note; The Committee was VERY respectful and pleasant to all of the parties and issues involved, and I sincerely thank them for the opportunity to debate the issue most important to our hearts, the overall protection of these animals. The vote on this bill is expected to take place shortly after Easter, so in the meantime, please feel free to contact members of this committee to voice your opposition to HB 4251, and please, be respectful. Thanks for reading and sharing this post, as together, we WILL make a difference!